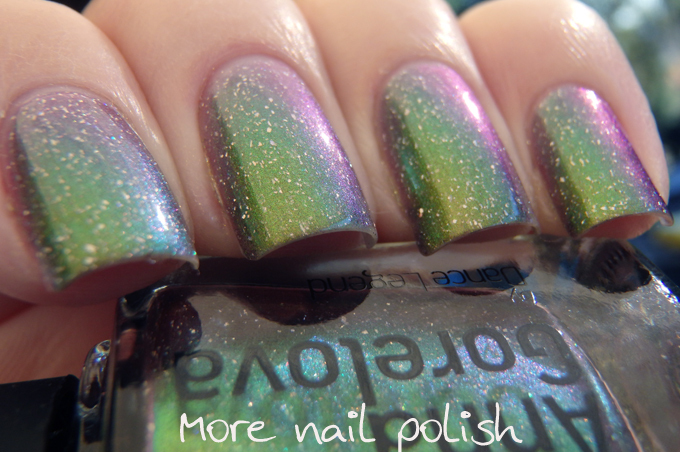 If you know about Dance Legend polishes, then I'm sure you know about Russian nail blogger Anna Gorelova. Anna is the lady with the beautiful nails behind all the Dance Legend swatches you find on the Dance Legend site. Anna also creates amazing nail photos by posing with unique props and perfectly posed hands that really showcase the polishes she is wearing. 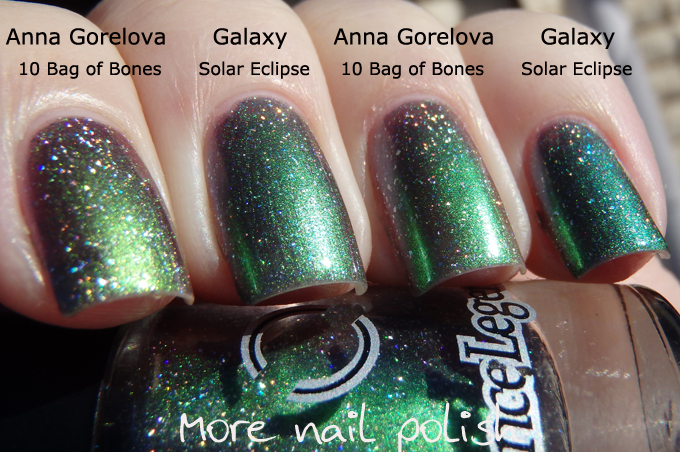 Not so long ago, Anna created a collection of polishes with Dance Legend. 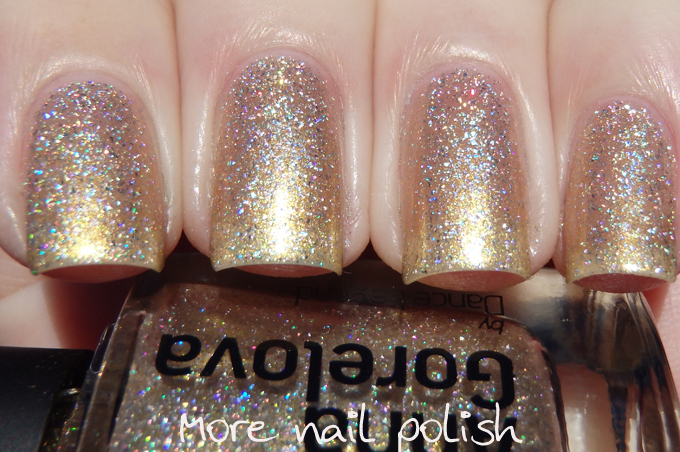 There are 12 polishes in the collection and I have my four top picks to share with you. 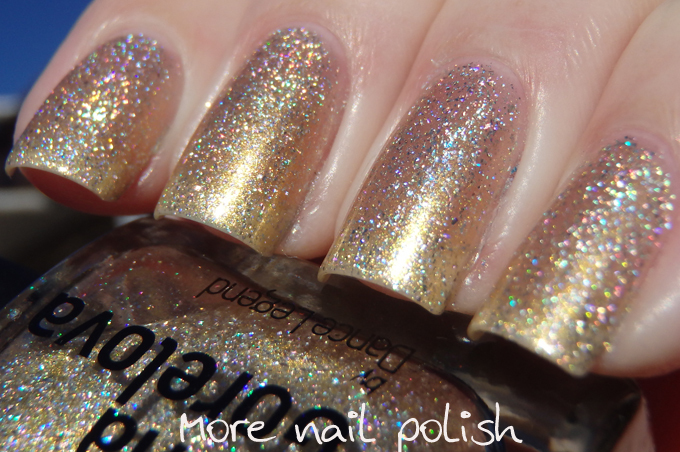 03 Gold Fish - There was no way I could go past this gorgeous gold scattered holo polish. The base is a gorgeous platinum gold and it's full of the large particle scattered holo particles that are also in the WOW prisms. 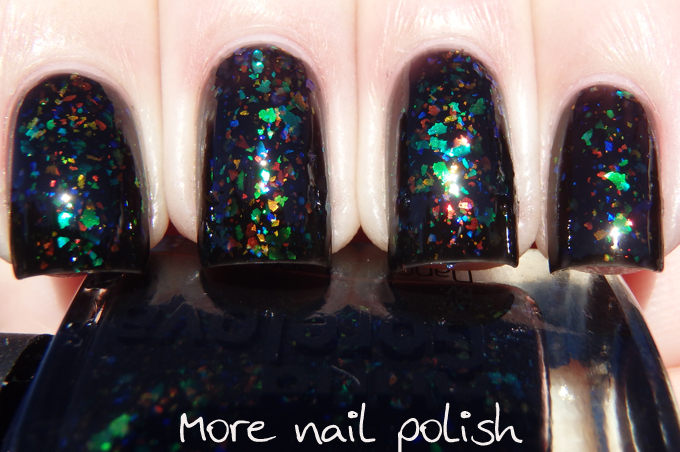 The holo particles aren't a dense in this polish as it is the WOW prisms, but the sparkly finish is just gorgeous. 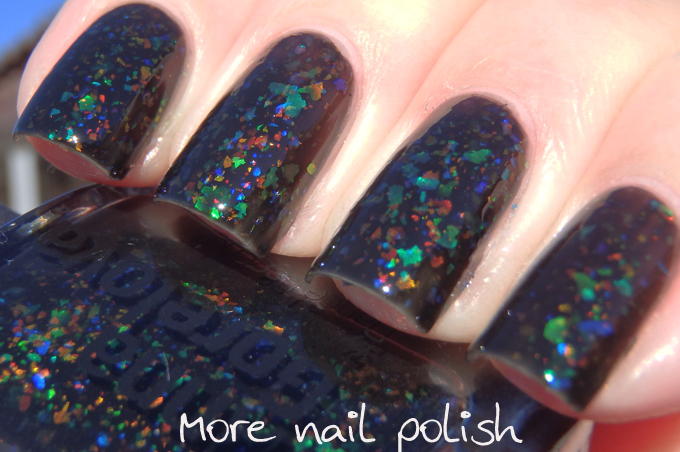 This is right up there with Ozotic 604 and Picture Polish Majesty as a favourite polish for me, but it's still different enough from both of them that I still need them all. 05 Lebedushka -what a fantastically unique polish. This is the palest blue textured polsh with a strong gold shimmer. Because the colour is so pale, it is a little sheer. I did two coats but probably should have done three to avoid some visible nail line and a bare patch on the ring finger. That aside, this is such a gorgeous 'winter' polish. It's like icy blue frost on your nails that sparkles and shines the in sunlight and looks like it should melt. I even added white snowflake stamping to this mani because it was just screaming 'icy cold' at me. 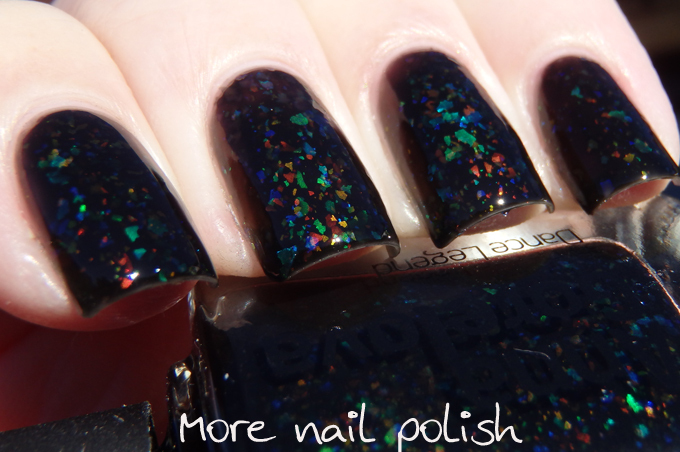 10 Bag of Bones - a stunning multichrome polish with scattered holo flakes. Bag of bones has metallic light bronze base which shifts to olive green and purple. Coverage was great and it doesn't need a black base to see the multichrome shift. 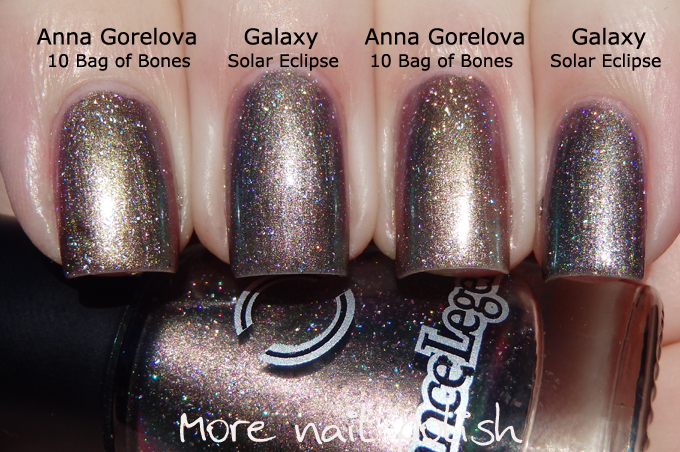 Much to my surprise, Bag of Bone is very similar to another Dance Legend polish - Solar Eclipse from the Galaxy range. They are not identical dupes, the base colour in bag of bones is a warmer bronze and the green is more olive toned, but they are certainly very similar. 12 Zmei Gorinic - Oh my. Flakie lovers, gird your loins. This one is a beauty. 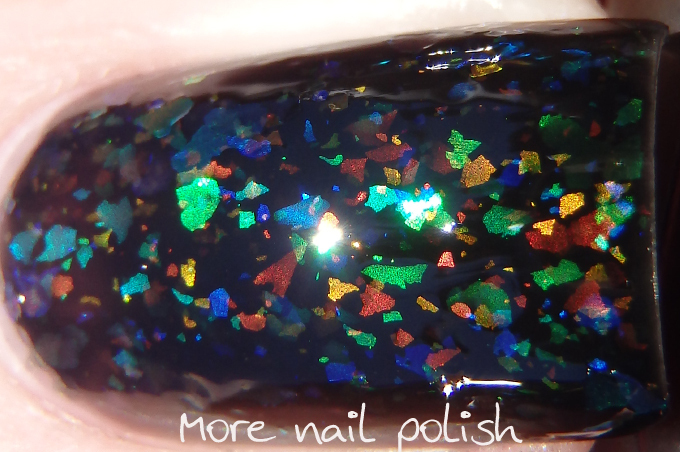 A perfect black jelly based jam packed with multicoloured flakies. I'm so sorry I forgot the 'matte all the flakies' rule when I wore this one, because I guarantee you this would look uber impressive mattified. 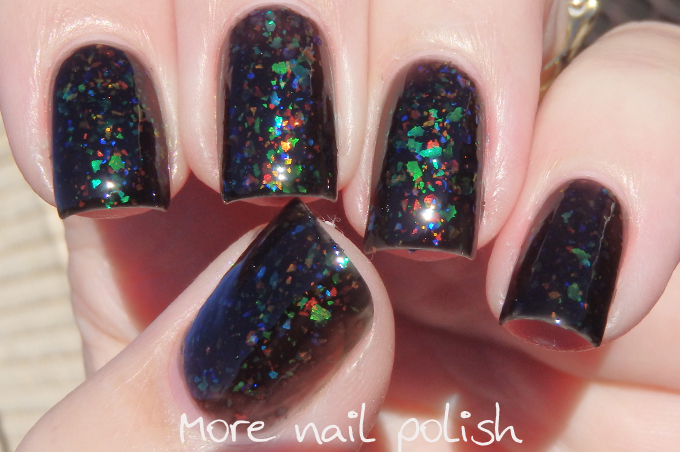 The black jelly base is just so perfect, it provides good coverage at 2 thick or 3 thin coats and you get such incredible depth through to the layers of flakies. It's so much better than flakies layered over a black base. You can purchase Dance Legend polishes direct from the Dance Legend website or through a number of other network resellers. I'm also reading about more and more ladies receiving their parcels from Dance Legend much within a few weeks, rather than a few months, so it looks like the new shipping company have made an impressive difference. Wow, I didn't think they'd be this gorgeous! I'm definitely picking up Bag of Bones, what a stunner! I have heard of Dance Legend but I have yet to buy any! These are simply stunning, I'm hard pressed to pick a favourite. Wow, I love the texture! These all look amazing! Beautiful swatches, as always! This is an absolutely gorgeous collection. My picks almost match your picks - I skipped Lebedushka but bought Mavka.